In the end, it was the team with home advantage in the Final Four that came out on top which led to joyous scenes in Tenerife. To be fair, Iberostar Tenerife have been one of the strongest teams throughout the tournament and would have been one of the favourites regardless of where the Final Four was taking place. However, with the home crowd roaring them on, and no indicator of pressure or nerves getting to the players in a way that would derail them, it was a fantastic night for all concerned who were backing the hosts to come through this challenge. 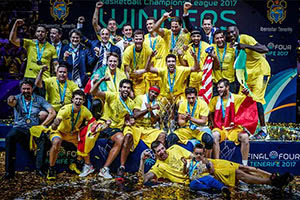 As the scoreline suggests, it was a close run thing and it’s not as though Iberostar Tenerife ran away with the first ever FIBA Champions League final. The game was in the balance until late on and Davin White played a massive role in closing the game off, with a huge three-point shot in the final minute of the game. There were a number of big performances from the Tenerife side but it was Marius Grigonis who received the MVP Honours for the Final Four. With 18 points, this was a straightforward decision to make and Grigonis definitely had a huge impact over a tremendous weekend of basketball action. White provided 14 points and 5 assists, so there was a strong team effort in getting the hosts over the line in this match. The MVP for the FIBA Champions League season was Jordan Theodore from Banvit and while he had a good game, he was unable to influence the final outcome. Jordan provided 17 points and 9 rebounds and he was a big factor in the game being pushed to the limits but in the end, the hosts had the upper hand and held on to it in an effective manner. The game reached a 53-51 scoreline late on in the fourth quarter and there were some people expecting a very close finish but with White seizing the initiative, it was the Tenerife fans packing the arena that were to enjoy their evening.